TA Investment Management Bhd kicked it up a notch to win three fund awards at this year’s Lipper Fund Awards from Refinitiv. 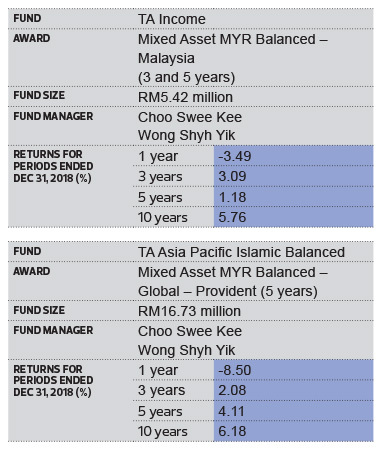 TA Income won the awards for Best Mixed-Asset MYR Balance in the three and five-year categories while TA Asia Pacific Islamic Balanced took home the award for Best Mixed-Asset MYR Global in the five-year category. Last year, the fund house made a comeback after a seven-year hiatus by grabbing two fund awards. CEO Wong Mien says TA Income outperformed its peers thanks to the team’s strategy of mostly investing in blue-chip companies and stocks that offer high dividend yields. The fund also outperformed its benchmark over a 10-year period by about 6%. “It is a low-risk conservative fund. Given the volatile market in 2018, the fund manager’s strategy to invest in the banking, consumer and real estate investment trust sectors has turned out to be the right move. The consistency and stability of dividend returns are the fund’s strong point,” says Wong. Both the investment team’s strategy and fund house’s investing philosophy contributed to the funds’ commendable performance, says Wong. The investment team identified countries that had a higher chance of outperformance in Asia-Pacific, then took concentrated bets on stocks they believed would outperform. “We review both the country and stock selection regularly to ensure that our investment strategy and stock selections outperform the benchmark. We also prefer value and growth stocks to benchmark stocks,” says Wong. The fund house will avoid the telecommunications sector this year due to stiff competition and limited growth locally and around the world. It will focus more on companies that pay out regular dividends such as banks and real estate investment trusts, says Wong.